On Thursday 9/29, co-founder and CEO Nimit Sawhney presented at HUBWeek’s The Hype and Promise of Blockchain event at the Boston Federal Reserve. For Voatz, the advent of blockchain is all promise and no hype. 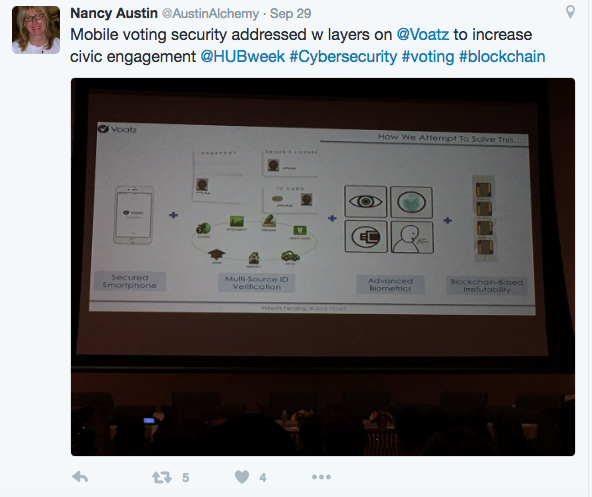 Nimit’s presentation covered how the Voatz software uses blockchain technology to protect and secure votes. In short, blockchain is a continuously growing list of data, in which each individual piece of information is linked to the preceding and subsequent “block” of data. This makes it virtually impossible to tamper with the data already written to a blockchain. As such, the Voatz software is highly secure, able to function in the presence of threats and, for all intents and purposes, is tamper resistant. 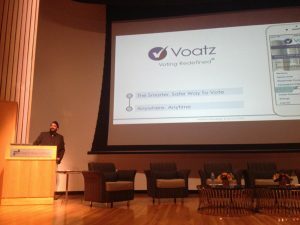 Nimit Sawhney, Voatz Co-founder and CEO, presenting at HUBWeek’s “The Hype and Promise of Blockchain” event at the Boston Federal Reserve. “ . . . [B]lockchain goes beyond banking, it also plays a potentially powerful role in voting. 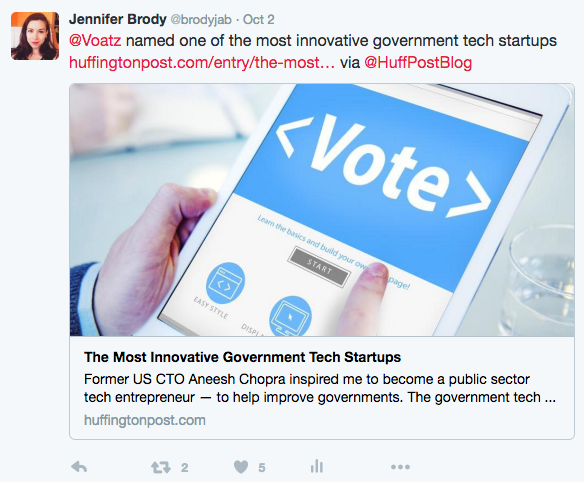 Nimit Sawhney, co-founded Voatz, a way to vote securely using blockchain, biometrics, and wearables. If it were around today, you could vote from your smartphone in the upcoming November general election. On Friday 9/30, Voatz participated in HUBWeek’s Demo Day at the Hynes Convention Center. Team Voatz (Simer, Isaac, Jennifer and Nimit) really enjoyed showcasing some of our latest features, answering questions and meeting Demo Day attendees who were interested in learning more about our exciting platform. If you missed us at Demo Day and are interested in collaborating with Voatz or beta-testing a pilot of our software, please contact us. 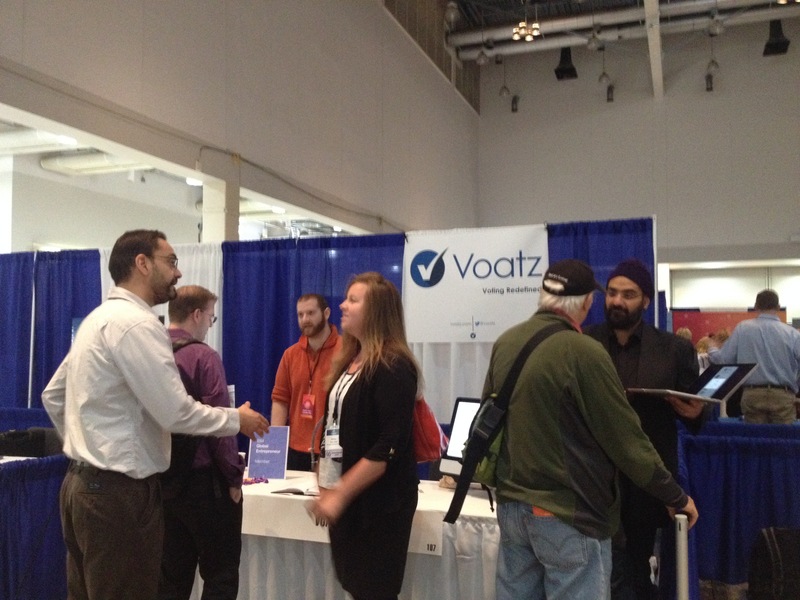 Team Voatz explains the platform to HUBWeek Demo Day attendees at the Hynes Convention Center. In addition to our HUBWeek events, Team Voatz attended the Faneuil Forum with Michael Sandel at Faneuil Hall on 9/26 and the Celebrate Boston event at WeWork South Station on 9/29. Harvard Professor Michael Sandel led a riveting discussion on the ethical implications of civic technology. An especially intriguing question Sandel posed is whether selfies should be permitted in the election booth. A sizable majority of audience members believed citizens should be free to publicize their vote if they so choose, and Team Voatz couldn’t agree more. At the Celebrate Boston party, we enjoyed meeting fellow civic-minded tech entrepreneurs over Asian noodles and coffee ice cream. Our congratulations to the HUBWeek organizers on putting together such a fabulous festival. Thank you for all you do to inspire social change and celebrate innovation in the Boston area. We are already excited to see what HUBWeek 2017 has in store!